The figure shown here was published in the excellent New Scientist magazine this week. It shows the results of a study into how mathematicians collaborated to solve a problem, which in many ways mimics how members of a community of practice may work together to solve a business problem, or to answer a problem of one of the members. "In February, 2009, an international group comprising mathematicians ranging from amateurs to elite professionals converged on the WordPress blog of Cambridge mathematician Timothy Gowers in order to attempt to prove a mathematical theorem; a project Gowers called Polymath1. Their results surprised even the project's most optimistic participants. In six weeks, the group had managed to combinatorially prove the density Hales-Jewett theorem, yielding in the process a host of new mathematical insights". A huge success for a collaborative approach, but equally interesting are the statistics shown in the diagram concerning where the contributions within the collaborative group came from. The diagram's vertical axis represents the number of contributions from each individual, the horizontal axis represents the "significance" of each contributor to solving the problem, and the size of the blob represents the professional seniority of each contributor, with small dots being "professionally junior" and big dots being "professionally senior". The most interesting thing about this plot for me, are the small dots in the "low volume, high importance" sector. These aren't the famous expert mathematicians, they are people such as Jason Dyer, a mathematics teacher in Arizona, which was able to throw light on one type of logic puzzle involved in the final solution. With tricky problems, its not awlays the experts that have all the answer. 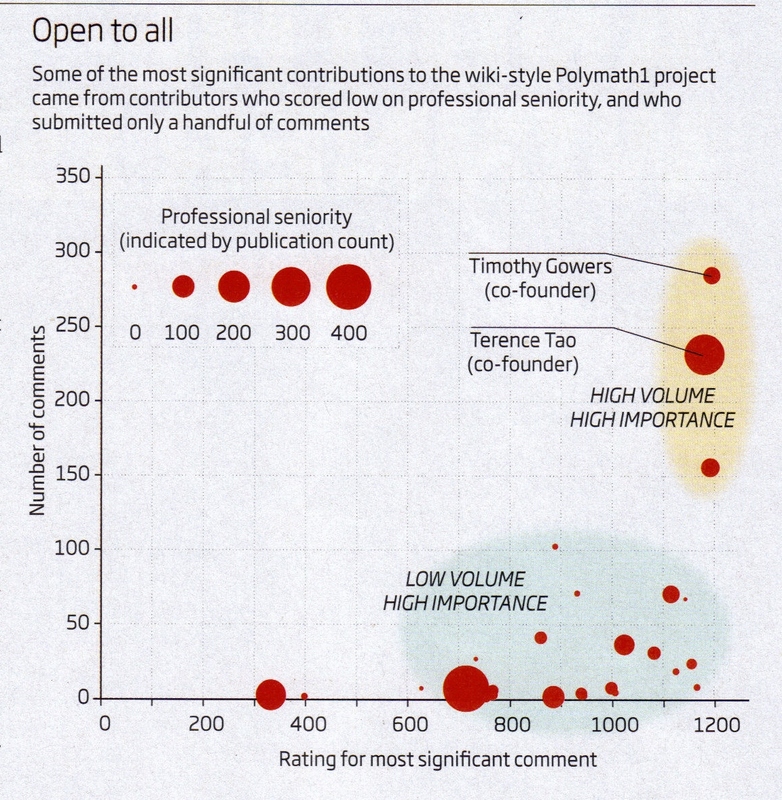 The diagram above shows that many people can contribute, and that the non-experts can provide crucial input. So what is the lesson for those of us working in Knowledge Management? I think this data throws light on one of the choices we need to make, which is whether we create communities of experts, or communities of practitioners. Some companies like to create communities of experts, or lists of experts, who people can go to if they have a problem to solve. The thinking is that "the knowledge is held by the experts, so they are the default people to go to". Other companies like to create communities of practitioners, or lists of everyone working in an area, who people can consult if they have a problem to solve. The thinking is that "the knowledge is out there somewhere; it might be with the experts, it might not, so let's ask everyone and see what we turn up". The former is like "phone a friend", the latter is like "ask the audience". 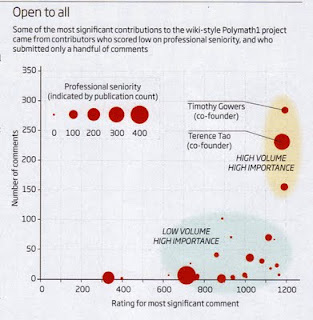 What the data from Polymath1, shown in the graph above, demonstrates is that the non-experts can make massively significant contributions, and that asking the audience seems to be, certainly for this type of problem, a far more effective strategy.